Authorities recovered a stolen vehicle and seized 23 pounds of marijuana from a home in the San Jose neighborhood, off U.S. 59, according to Laredo police. 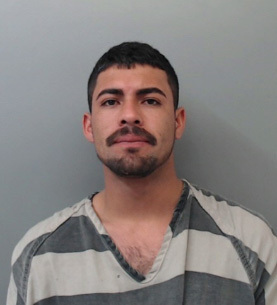 Authorities also arrested Flavio Amador Alvarez-Vasquez, 24, and Eloy Martinez-Vasquez, 24, on the charge of theft. Alvarez-Vasquez was additionally charged with possession of marijuana. At about 1 p.m. Wednesday, LPD&apos;s auto-theft task force received information that a stolen white 2017 Ford F-250 was at a residence in the 100 block of Ojotillo Loop. Investigators conducted surveillance at the property and discovered the stolen F-250. Police said the vehicle was reported stolen on Jan. 31 in San Antonio. As the investigation progressed, investigators also found 23 pounds of marijuana inside the home on Ojotillo. Alvarez-Vasquez and Martinez-Vasquez were then taken into custody. From Under The Influence with Marijuana Man: Help! Police! They&#39;ve Stolen Recreational Marijuana.